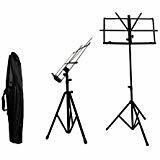 "Besides an instrument itself, musicians also need the assistance of a reliable music stand. A good stand can help prop up your sheet music while performing, which makes things a lot less hectic. While most of the time any kind of music stand will do, this only applies if you are using it primarily at home. If you will be performing away from home, you will need to look for specific qualities to ensure your stand will be a reliable companion." The model #48 by Manhasset is one of the single most reliable, time-tested music stands out there. If you ever took instrument lessons when you were younger, you likely used one of these stands without knowing it. The whole thing is made using brass bearings, heavy-duty chrome, and a steel-welded base. The point is, this stand isn’t breaking or falling apart any time soon. It does ship in three pieces (music tray, body pole, and base), so you’ll need a standard wrench or socket wrench to put it together. It’s quite easy to do so however, and you won’t spend more than 15 minutes getting it all assembled. Once constructed, the stand features a “no-knob friction-tilt neck” that makes it super easy to adjust the tilt and rotation of the music tray to meet your personal preference exactly. This might be the best part for me, as plenty of other music stands out there involve screwing and unscrewing knobs in order to get the neck to stay tilted how you want it. You can literally adjust this one single-handed, mid-performance if you need to. This no-frills stand by Musician’s Gear is a simple stand that’s affordable and reliable. It doesn’t have some of the fancier bells and whistles that more expensive stands ship with, but it gets the job done quite well nonetheless. This is a folding stand, so it’s perfect for transporting if you find yourself performing on the go. It also features an adjustable height, ranging anywhere from 37 inches to 58 inches. My favorite aspect of this stand is simply how stable it is. There’s absolutely no rocking, no flimsy pieces, and no lightweight material involved at all. You set it up, put your music in the tray, and it just…sits firmly on the ground in front of you. That might sound obvious, but there are far too many stands out there that do not do just that. The three legs are capped with rubber ends for added stability, and as an extra bonus this means you won’t have to deal with scuff marks on your floor. ULTRA-PORTABLE - Fold, place in carrying bag and throw it in a backpack, purse or grab the case by the handle and go. Perfect for practice, rehearsal, and performance. ADJUSTABLE - Angle adjusting knob which allows your sheet music to be placed at the most comfortable angle, whether you're sitting or standing. STURDY - Extremely sturdy and stable for its lightweight and small size, this medium capacity stand comes with a waterproof case, making it perfect for any weather. If you’re looking for a portable stand that’s still as solid as a rock, the Solid Top model from Gearlux is for you. It’s quite easily transported, but is also as sturdy as they come. It honestly might be the best stand for outdoor performances I’ve come across. The large tray on top can easily hold several heavy music books, and it’s made entirely out of steel – this means you can anchor any sheet music down with magnets, which is an invaluable function if you ever have to perform under slightly windy conditions. Gearlux’s stand comes in several different versions, including attachable models as well as collapsible solid top and collapsible vented models. The whole thing is height-adjustable between 28 and 48 inches, so it works fantastically from a standing or a sitting position. The legs fold quite easily too, contributing to the overall portability of the music stand. This professional-grade stand from On-Stage definitely costs a bit more than some of the other music stand options out there, but you get more than your money’s worth. The entire thing is incredibly adjustable – it features angle adjustment knobs, friction locking knobs, and dedicated leg support straps to ensure you can get it set up exactly as you want it from top to bottom. Speaking of bottom, the legs are fantastically designed. They all connect via “hi-impact plastic leg housing” and are capped with no-slip rubber as well as the dedicated support straps. This stand is definitely one of the most rock-solid stable options out there thanks to all of these cool little innovations by On-Stage, in addition to the high grade metal used to make the stand in the first place. Last but not least, the whole thing is adjustable from 24 to 45 inches tall, making it perfect for both standing and sitting musicians. As an added safety features, the edges of the music tray are “rolled,” meaning they’re not sharp and you won’t knick yourself on them while transporting the stand or while flipping through music in a hurry. There are a couple of music stand styles to choose from beside the standard one that holds your music sheet. These ones are designed with a modern approach. Laptop Stand – With the advent of technology, our music sheet is slowly being replaced by more recent gadgets. Your laptop and tablet, for example, can be used to view musical score sheets. The laptop stand design, for example, is designed to hold your, you guessed it, laptop, tablet, and netbooks. It is a freestanding support product that can also be adjusted to help angle the device for a clearer view. Tech Stand – Similar to the laptop stand, the tech stand is designed specifically for use with your gadgets like laptops and other devices. You could say this is a good option for DJs. This is also a frees standing equipment that has an adjustable height and top platform for better angles. Dolly for Music Stands – Again, if you will be using your music stand in your performance then having a dolly will be essential. This is a wheeled storage for music stands and can hold a variety stands for easy transportation. As a musician, you are no doubt the creative type, yes? Most music stands come in a plain design. Try to customize your stand using decals or spray paint it with your preferred color. This might seem like a small deal but it will help greatly in developing your personality as well as improving your confidence when playing in public. If you are a traveling musician or mostly perform publicly then a music stand that is portable and easy to transport is a key element you should not ignore. Most will not even think of their stand’s portability as a factor which actually bites their behind down the road. Remember that mobility is essential when it comes to a musician. You want your equipment organized and compact to save space and money. In this regard, you can find musical stands that can be folded into a compact size that can even fit your bag. Rotating Top Platform – Now that we are in the high-tech age, chances are you will be using your laptop or netbook a lot. In this case, you should look for a music stand that offers a rotating platform. This allows you to angle the top platform so that you will be able to clearly see what is on the screen without physically moving the entire stand. Music Stand Handles – Look for a music stand that uses rubber handles or grips on the dolly. This is more of a comfort aspect but remember that you will be hauling this equipment around a lot. It would be wise to choose one that is actually comfortable and easy to transport. Tension-Tilt Platform – This feature refers to the pressure tilt capability of the reading platform on your music stand. It allows you to adjust the angle of the reading surface by applying pressure which is way easier and quicker than having to physically turn a knob with both hands. Pencil Ledge – Another overlooked feature, this one is basically a part of the stand wherein you can place your pencil or other similar writing tools. If you are using music sheets then this is an essential component. Low Profile Music Stand Legs – Commonly has an V or X design. Choose one that has a low height to feet difference. This allows it slide easily beneath chairs. You don’t want a music stand that keeps bouncing off other equipment, right? Wheels – As for the wheels of your dolly storage compartment, try to look for 8-inch diameter ones as these are the ones that offer the best support and stability. Rolled Steel Edges – As the name suggests, this one uses smooth rolled steel without any hard or sharp edges. This is to help prevent damage in the event that it collides with another equipment. Zinc-Plated Steel – This one helps prevent wear and tear damage such as rust. It also protects your music stands from damages caused by moisture and the natural elements. Aluminum Construction – The most common one. It is designed to be lightweight and durable. A great well-rounded choice. Other than being portable, a music stand should be easy to set up and take down. It should also be durable enough to prevent wear and tear as musicians will be setting it up and folding it several times a month. Find a music stand that features a nice and easy design that allows for quick set-up and dismantling. There are literally dozens of music stand styles and designed to choose from. The key elements that you need to take into account are durability, convenience, and portability. There are even different types of music stands for different musical instruments. What I listed above covers the base of what you need your music stand to do. Remember that it is best to not be stingy when it comes to equipment such as this. It is smarter to invest in high-quality equipment rather than settling down for a cheap but easily broken one.